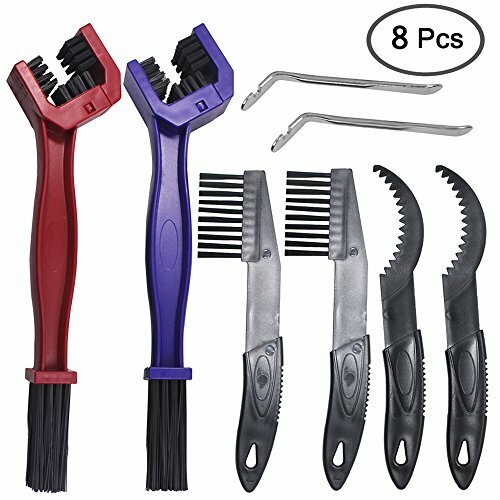 These tools suitable for different bikes if there is a chain, no matter mountain bike, mtb, road bike, BMX, all could get a deep cleaning. One-sided brush and chain gear cleaner apply to dental plate, chains, flywheels and other more narrow bike space, aim to solve the cleaning problems of small corners. With toothed cleaner, scraping the dirty things in the corner of the gear plate, and then use one-sided brush to clean out. With the bicycle chain clean tool set, men and women rider bicycles always get a full and deep cleaning. WIDELY USE: The multi-purpose cleaning brushes can be used for gears, chains, suitable for different bikes if there is a chain or gear, no matter mountain bike, mtb, road bike, BMX, all could get a deep cleaning. MATERIAL: These chain brushes and chain gear cleaners made of high quality plastic material which is hard to be broken. Usually riders could repeatedly use this bike chain tool set for bike maintenance. THREE-SIDED BRUSH: Full Coverage, use 3-sided bristles allowing you to clean all 4 sides of your chain, and the long bristle side lets you clean other parts of your bike like sprockets and wheels. ONE SIDED BRUSH AND CHAIN GEAR CLEANER: Apply to dental plate, chains, flywheels and other more narrow bike space, aim to solve the cleaning problems of small corners. With toothed cleaner, scraping the dirty things in the corner of the gear plate, and then use one-sided brush to clean out. PACKAGE: 2 * Three Sided Brush (Red,Blue); 2*One Sided Brush (Black); 2*Chain Gear Cleaner (Black);2*Pry Bar.